When it occurs the boiler does not get enough pellets to start a fire. This usually happens when the store is less than half-full and the remaining pellets are heaped up around the sides of the store and not over the auger in the center. 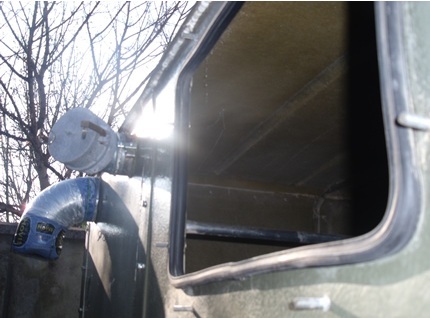 One can solve this by opening the pellet store when the pellets are low and climbing in through the opening as shown below; take care to disconnect power to the boiler/ auger first. Usually all the remaining pellets will be stacked against the sides. 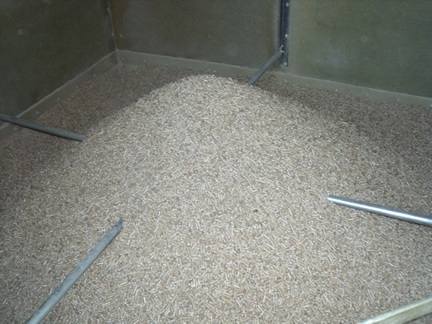 Standing in the pellet store one needs only to move the pellets into the middle of the store (as shown in the photo below) so that the weight of the pellets themselves allow them to enter the auger easily. After closing up the pellet store securely, go around to the auger feed and tap the tube until the pellets in the tube fall back towards the pellet store. 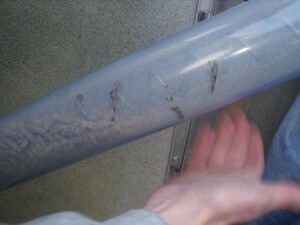 The object of the exercise is to try to leave a large gap in the tube (you will now be able to see the auger easily). 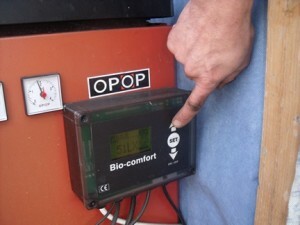 Start the pellet boiler manually from the control box situated on or next to the boiler (and not from the timer, usually located in the house). During the ignition phase press the auger feed button so that the auger turns and brings the pellets up the auger tube. This may take a minute or two, so keep the button pushed until pellets fall into the fire box. Release your finger when this happens and the boiler should automatically feed more pellets and begin the normal sequence to start and heat the water in your home. Though this work seems cumbersome, it really only takes about 30 minutes and will help keep the boiler working a few more months until you get a new supply of pellets. Remember this extra work once every 12 months or so will allow you to squeeze the maximum bulk delivery of 3 tonnes of pellets into your store to possibly last you through 2 winters (for a house of 100 sq metres) at a cost of approximately € 0.65/ hour. A few words of caution on the previous advice. Any pellet store that is big enough for you to get into should be treated as an ‘enclosed or confined space’ and appropriate safety procedures should be followed. Wood pellets can create an atmosphere that is oxygen depleted. It is unlikely that most of us have access to an oxygen meter, but if you do have one test the atmosphere in several places before entry. Before you enter a pellet bin open all the access doors and allow the space to ventilate for at least 30 minutes, preferably with forced ventilation. When you enter make sure that someone is outside the door to keep an eye on you with instructions to call for help (999 fire brigade) if something happens and not to enter themselves. Make sure that doors are tied open so that they can not close inadvertently, trapping you inside, and take some form of communication inside with you – a mobile phone. Be aware that wood dust is very combustible so no naked flames or smoking inside the bin. The problems associated with the pellets accumulating around the side of the bin can be solved by making the bottom of the bin with sloping ‘hopper’ sides – make sure that the angle of the sides is greater than the critical angle of repose of the pellets – about 40 degrees should do. Other causes of ignition failure include – damp pellets, excessive dust being fed into the burner along with pellets, build up of clinker so that pellets are not close enough to the igniter, igniter failure, excessive draft in the boiler so that the pellets do not get a chance to heat up, exhaust fan running too high. If your igniter fails you can fire a boiler manually by using a small piece of firelighter or a hot coal to get the pellets smouldering and then start the boiler. Once a flame is established the boiler will keep going on automatic until it reaches the normal cut out point and you will then have to refire it when the water temperature drops again. I kept my boiler going in this way during the really cold weather while I waited for a spare igniter to arrive. Thanks for the comments, some really good points. Its an important point about accessing confined spaces. Its probably better if people try to move the pellets without getting into it, maybe using a long tool to reach into the hopper if necessary. Where did you get the spare igniter from? The above post really helpful but Ean Wallace described it very well and made all of us aware. If you don’t like the idea of climbing into the hopper use a garden rake(you might have to make an extension for the handle using another ‘broom’ handle) use this to pull the pellets away from the corners of the hopper. I am presuming the hopper of course is square, pellets in the corner become damp and turn to mush, so this raking should be done often, perhaps once a month. 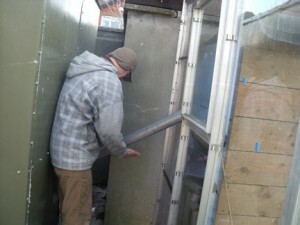 A good coat of paint on an outside hopper helps prevent damp. I strip down my GERKROSS boiler once or twice a year to give it a good clean. Undoing the nuts on the top and opening all the doors allows access to all sections, you can give a good clean with a ‘Hoover’ . A couple of times I have taken the steel case off the blower and cleaned the sensor/ignition light situated to the right of the blower. I have had to do this when ignition failure has occurred . Pellets can break down into sawdust, this can ‘gum’ up the works, to avoid this I have drilled holes in the internal auger, small enough not to allow the pellets to fall through, but big enough to allow the sawdust through. Hi my burner has just started cutting out. I just put a new fan on as the pellets weren’t burning just clogging up on the grate. It lights and stats on for a while then the go and goes out. Any ideas what I should do? Thanks.